Canada is formally participating in the deployment. “The Canadian Navy has dispatched Frigate HMCS Ottawa, which is now an integral part of Expeditionary Strike Group 5, under U.S. command. It is worth noting that particular emphasis has been given to medical evacuations and combat medical support suggesting that a combat scenario could be envisaged,” Dr Chossudovsky points out. Canada first began deploying naval ships to the Persian Gulf in the aftermath of the anti-imperialist revolution of the Iranian people in 1979 which overthrew the U.S. puppet Shah Pahlavi regime. In the months leading up to the invasion of Iraq in March 2003 Canada deployed the destroyer HMCS Iroquois to be the command-and-control base for a “multinational“ task force of up to 20 ships in the Gulf and the Strait of Hormuz, headed by Canadian Commodore Roger Girouard. “Tehran considers the U.S. war games to be conducted in the Persian Gulf, off the Iranian coastline as a provocation, which is intended to trigger a potential crisis and a situation of direct confrontation between U.S. and Iranian naval forces in the Persian Gulf,” Dr Chossudovsky says. “Reports say the U.S.-led naval exercises based near Bahrain will practise intercepting and searching ships carrying weapons of mass destruction and missiles,” Iran’s official news agency IRNA said. It quoted an unnamed foreign ministry official as describing the military manoeuvres as dangerous and suspicious. The BBC quoted the Iranian foreign ministry official saying the exercises are not in line with the security and stability of the region. Instead, they are aimed at fomenting crises. USS Boxer Expeditionary Strike Group (ESG 5) is comprised of USS Boxer (LHD 4), USS Bunker Hill (CG 52), USS Dubuque (LPD 8), USS Comstock (LSD 45), USS Benfold (DDG 65) and USS Howard (DDG 83). The strike group also includes Amphibious Squadron 5, the 15th Marine Expeditionary Unit, Coast Guard Cutter Midgett (WHEC 726) and Canadian Frigate HMCS Ottawa (FFH 341). 1.“U.S. Naval War Games Off the Iranian Coastline: A Provocation Which Could Lead to War? 2. BBC, 23 October 2006. ALTHOUGH the vast majority of Canadians want an independent and nuclear-free Canada, a Canada which is a factor for peace, not war, the Government of Canada continues to welcome the unceasing “visits” of U.S. and NATO nuclear-capable warships with open arms: no questions asked. Its total hypocrisy is to the extent that it also claims to be the greatest upholder of the Nuclear Non-Proliferation Treaty under the pretext of “security” when it comes time to attacking independent states who are not kowtowing to the dictate of the United States. The U.S. Navy gives no information whatsoever to Canada regarding these menacing deployments. It has a very convenient policy of “neither confirming nor denying” the presence of nuclear weapons on its ships. This extra-territorial rule allows both the American government and an obsequious Canadian government to sidestep and divert the issue of whether Canada is allowing the nuclear weapons into Canada. 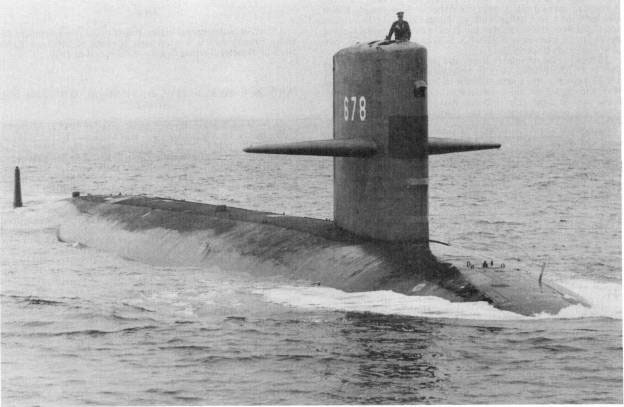 The U.S. Navy, which is the best equipped and trained in the world, admitted to having over 600 nuclear accidents between 1965 and 1987. Just one detonated nuclear attack submarine could devastate a port city with the power of five thousand 1917 Halifax explosions. The nuclear arms on these warships include tactical, intermediate, and strategic weapons. Under a succession of secret agreements which originated at the time of the formation of NATO in 1949, successive Canadian governments have allowed the United States not only to establish bases on Canadian soil but also to base and store part of its nuclear as well as chemical warfare arsenal in Canada. As many as 500 or more nuclear weapons were stored or deployed with the express permission of the federal cabinet. The sole government which disagreed, that of Conservative John Diefenbaker, was removed in 1963, in a covert operation headquartered in the basement of the U.S. Embassy in Ottawa. In terms of the U.S. navy, nuclear depth charges are the nuclear weapons most frequently carried into Canada. 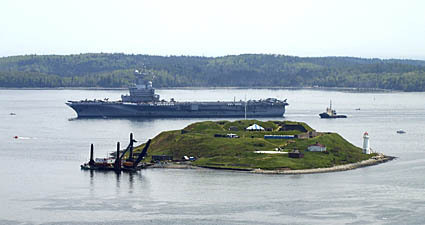 In 1985 the Pentagon revealed secret plans for installing nuclear depth charges within Canadian waters and ports along with anti-cruise missiles; it continuously uses berthing facilities at CFB Shearwater in the community of Eastern Passage of the port of Halifax, a city of over 200,000 people, for its nuclear-armed submarine fleet. It has also secretly dumped chemical munitions on the seabed of Canada. For the information of our readers, we are posting the following sensationalist news report concerning military-civil exercises organized around a so-called “mock disaster” by the military reporter of the Halifax Chronicle-Herald. While confusing both the origin and the nature of the threat posed to Nova Scotians and the people of Canada, the journalist does acknowledge the grave dangers posed by the “visits” of U.S. and NATO warships to Canadian ports. These threats all emanate from the lack of political control by the Canadian people over their harbour and nation. As a result, the Canadian government has issued special executive decrees such as the “controlled access military zones” (Order-in-Council, 31 October 2002) under the Visiting Forces Act. It has put into place programs in our ports working with U.S. Homeland Security and Northern Command under the pretext of “security,” “interdicting the drug trade,” and “stopping asylum seekers” aimed at protecting the warships of foreign powers. The exercises are also part of the pressure by the United States to integrate border security under U.S. command and unify military and civilian agencies as part of agreements such as the “Smart Border Action Plan” signed between Canada and the United States following September 11. It is only normal that the people of Halifax and other major ports should be concerned about what the Pentagon and the Canadian government have in store and the threat posed by U.S. warships. This concern is that if Canada is not defending its sovereignty, it is also not defending the safety and security of its citizens. It is therefore no surprise that the monopoly-owned media characterizes the government’s plans in a manner that seeks to keep Haligonians pessimistic. The Chronicle Herald is second to none in this regard: a member of the military affairs committee of the Board of Trade, it champions the “visits” of U.S. warships as “good for business.” It stirs up the spectre of foreign “terrorism,” hysteria about anthrax, and suspicion of Muslims to accept the stepped-up nuclear danger in the offing as part of the price to pay, thus promoting a sense of inevitability, passivity and/or desperation in the face of such terrorism. One aim is clearly to paralyze the port workers in the face of the situation in the name of Bush’s War on Terrorism. Another aim of the “mock exercises” is that they are a prelude towards establishing martial law under Bill C-55, the Public Safety Act 2002, to protect American warships and troops in Canadian harbours and waters. Keeping in mind the media’s attempt to divert attention from the war preparations the government is carrying, by spreading pessimism on the one hand and illusions about “nuclear free zones” on the other, we should stay focused. 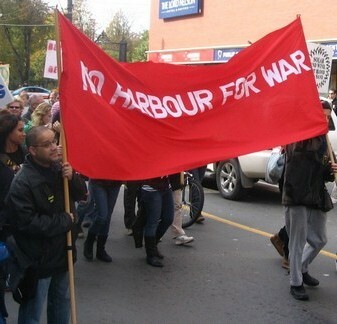 Far from remaining passive in the face of the situation or relying on lobbying those responsible for the situation in the first place, Haligonians can make headway by building the No Harbour for War Program and practical politics to defend their interests. There is an alternative! HALIFAX (12 October 2006) – MILITARY and civilian officials responded to a mock disaster aboard a visiting nuclear submarine Wednesday in Halifax. Organizers used a temporary shower set up in an ambulance bay at the Halifax Infirmary to decontaminate about a dozen victims of the fictional accident. While Wednesday’s scenario involved a sub, officials stressed it also tested how everyone from sailors to doctors would respond to a terrorist attack. “The objective of the exercise is to prepare Canada for a radiological, nuclear, counter-terrorist event,” said Diana Wilkinson, a radiation biologist with Defence Research and Development Canada. The Queen Elizabeth II Health Sciences Centre has never dealt with patients contaminated by radiation, though staffers practise disaster planning regularly, said Karen MacRury-Sweet, director of heart health and emergency for the Capital district health authority. “You will only use it once, or maybe never, but you have to know what to do,” she said. It’s important to plan for such a disaster, said Dr. Katrina Hurley, an emergency medicine resident at the QEII. “As professionals, it’s important to provide whatever care can be provided,” Dr. Hurley said. In the case of something leaking from a nuclear sub’s reactor, the hospital would be able to provide care, she said, noting some types of radiation cannot be washed off. Dr. Hurley, who belongs to an organization called Physicians for Global Survival, is lobbying politicians to make Halifax Harbour a nuclear-free zone. “There is no treatment as good as prevention,” she said. “Much, much, much more effective than trying to wash people off in showers and conduct disaster exercises would be to prevent such a thing from occurring in the first place. The nuclear emergency response team from CFB Halifax was part of Wednesday’s training scenario, which started with a pretend sub accident at 12 Wing Shearwater. Military officials said there was no real sub involved in the exercise, though visiting British and American nuclear subs can sometimes be spotted at the Shearwater dock. There has never been an accident in a Canadian port involving a nuclear-powered vessel. “The likelihood of a nuclear reactor accident involving a nuclear-powered vessel visiting a Canadian port is extremely remote, even though it cannot be entirely ruled out,” says a Defence Department backgrounder on the topic. About 25 nuclear-powered vessels visit Canada every year, according to the document. Halifax and Esquimalt are bound by international agreements to accept nuclear-powered warships belonging to some of Canada’s closest allies. (This is incorrect or a lie, as the so-called “international agreements” are bilateral or by virtue of the Visiting Forces Act – TS) Nanoose, B.C., is the only other Canadian port where they can tie up.